One of the most pervasive beliefs in the fitness industry is the myth that you have to eat breakfast first thing in the morning to kickstart your metabolism. It’s as if there was a magical metabolic switch that turns on once you eat a meal in the morning. Alas, if only losing fat were that easy. If eating breakfast was so important to maintaining a healthy weight and lean body, then why do studies show that 90 percent of the North American population already eat breakfast first thing in the morning – and yet more than HALF the North American population is either overweight or obese? Eating breakfast is an unnatural act for our bodies, especially when it comes to eating a fat-burning diet. Our ancestors naturally skipped their first meal of the day because their lifestyles required them to hunt for their foods in a fasted state. Back in our Paleolithic days, we did not have quick access to food as we do today. You’ll see that skipping breakfast can be used as an effective tool for transforming your body. Despite what some experts will tell you, skipping your breakfast does not correlate with having a slower metabolism. Studies actually show that there is no difference in calories burned over 24 hours between people who eat or skip breakfast (1). So you might wonder, what does rev your metabolism? The main drivers of your metabolism are exercise, daily movement, and, to a large degree, the amount of energy it takes to keep your organs working in your body. If you’re eating breakfast first thing in the morning to boost your metabolism then you can stop. Instead, rely on exercise, building muscle, and daily movement to burn those extra calories. In a four-month-long study that compared recommendations to eat or skip breakfast in 309 overweight/obese men and women, researchers concluded there was no difference in weight between groups (2). The study concluded that eating breakfast simply didn’t matter. Sorry to say, but there is no such thing as eating breakfast for weight loss. Your metabolism is a 24-hour process that is on at all times. I hate to beat a dead horse but eating foods at specific times (like breakfast) will not enhance your metabolic rate. Your weight loss will largely depend on the amount of food you’re putting into your body on a regular basis. In the end, if you want to lose weight, then it’s all about how many calories you take into your body and your activity that counts the most. Eating a healthy breakfast first thing in the morning will not enhance that effect. Contrary to popular belief, your brain actually works just fine when there is no food in your stomach. In a test where twenty-one college-aged people were asked to perform a series of intellectual tests after having either a normal meal, skipping one meal, skipping two meals, or going 24 hours without food, researchers found no difference in performance on measures of reaction time, recall or focused attention time. This study led the authors of the study to conclude that short-term food deprivation did not significantly impair cognitive function (3). These results have been confirmed in additional studies where healthy young adults ate as little as 300 calories over a two-day period and experienced no decrease in tests of cognitive performance (including vigilance, choice reaction time, learning, memory, and reasoning), activity, sleep, and mood (4). In fact, not only has research shown that short-term fasting doesn’t impair cognitive function, but it also suggests that long-term calorie restriction may improve memory in older populations. When researchers put a group of fifty women with an average age 60.5 on a calorie-reduced diet for three months, they found that the women had significantly improved scores on verbal memory tests (5). Give breakfast skipping a try for about a week and you’ll notice that your brain and body will work just as well (if not better) when there is no food in your stomach to weigh you down. When you skip breakfast you are actually doing a short-term intermittent fast from your last meal yesterday to the time of your first meal today. What you need to know is that when you do a short-term fast, your body is having a meal of its own adipose tissue – your body fat! Fat must be released from its storage spot (your body fat), transported through your system, and get to a cellular engine where it will be burned, typically in your muscles or organs. While you are resting, your muscles are a major contributor to your metabolic rate, along with your organs. During a fast, muscles begin to switch fuel sources and start oxidizing fatty acids from body fat. In other words, when we do a short-term fast (like skipping breakfast), our muscles turn into fat-burning machines. Delaying your first meal to later in the day mimics this fasting effect, enhancing your body’s ability to burn fat. Growth hormone is an extremely important hormone which, throughout evolution, has had the responsibility of maintaining growth and lean body mass during times when food is sparse. Remember our Paleolithic ancestors, whom I mentioned earlier? They needed this short-term spark of growth hormone to increase their hunting capabilities in the morning. Increased strength and muscle mass (6). Growth hormone (GH) is mainly known in popular circles as the youth hormone that celebrities pay thousand of dollars to inject into their bodies, but little do they know they could have gotten it for free just by doing a short-term fast. By skipping breakfast you can increase your body’s natural level of GH by as much as 500 percent, complete free of charge (10). When it comes to losing fat, the equation is more about the combination of how many calories you have going into your body and how many calories you burn throughout the day through exercise and daily movement. 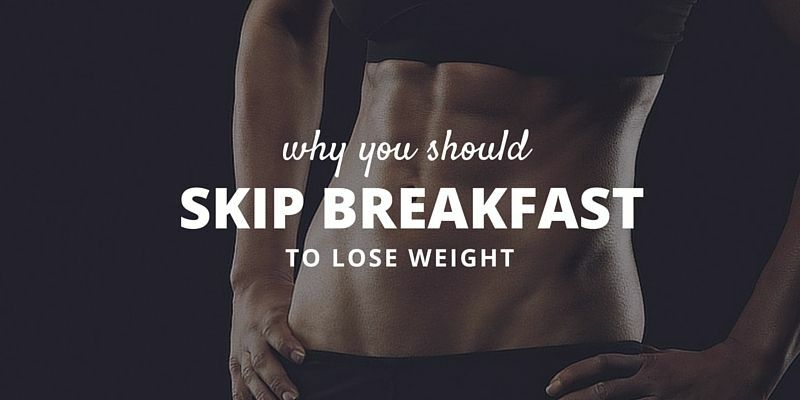 By skipping your breakfast you are basically skipping an entire calorie-containing meal. If one meal was skipped that would leave you with 300-500 less calories to eat throughout the day. Would you end up losing weight on 300 to 500 fewer calories throughout the day? Absolutely. We know now that skipping breakfast is safe for your metabolism and brain. We also know that skipping breakfast can have a multitude of benefits for your body. So how, specifically, would you skip breakfast safely? Here are 5 tips to help you along the way. a. Delay breakfast by one hour at a time. If you have been eating breakfast habitually for the past couple of years then adopting a delayed breakfast schedule may be hard to do at first. That’s why I recommend delaying your breakfast by one hour every one to three days (depending on your mood) until you can get to your targeted time of eating your first meal. Integrate the later “first feeding” slowly and do it as comfortably as possible when applying to your lifestyle. b. Follow a timed meal structure for at least one week and then modify the plan to suit your schedule. One of the best ways to modify your appetite and control your hunger is to put your body on a regular schedule of eating. And one of the best meal structures we start our clients on is a 12 p.m., 4 p.m., and 8 p.m. eating schedule. Our clients adopt this plan and, over time, they modify it based on their lifestyle needs. Following this type of meal schedule allows our clients to effectively get the benefits of skipping breakfast while allowing them to have the option to eat later on at night. Whatever you do, follow a meal structure of your own or take the one above. You’ll notice that about a week into eating according to a meal schedule your body will adapt to the timing, and you’ll start to get hungry around the times you schedule yourself to eat. c. Make your first meal a healthy one that is high in protein. Your first meal sets the context for how you’ll eat for the rest of the day so make it a good one. There’s a lot of debate on what is a healthy meal and what is not so I’ll make it simple: For your first meal eat unprocessed foods, with a quarter or more of your plate filled protein and the other three-quarters containing vegetables. Need some inspiration? Check out these recipes. Eating more protein in your first meal (and meals afterwards) leads to greater satiety and increased appetite control (11). Yuri does a great job explaining this when he discusses breakfast foods. d. Drink a half liter of water upon waking. When you wake up, your body has gone seven to eight hours without water, so there’s a good chance if you feel hungry you might actually be dehydrated. 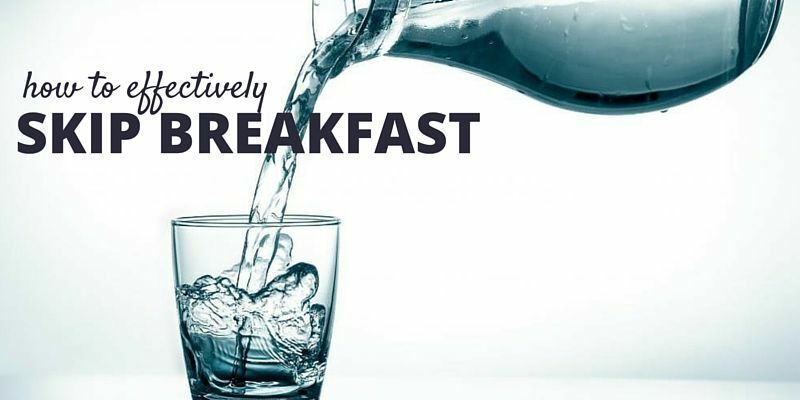 Drinking water first thing in the morning hydrates your body, keeps it energized and more satiated throughout the length of your fast. e. Add a pinch of sea salt to your morning water. Drinking water with lemon (or apple cider vinegar) and a pinch of salt helps in absorbing water and aids in digestion. When one consumes water with natural salt, the body can actually absorb and use the water you are taking in. As for digestion, the process begins in the mouth, and consuming salt activates the salivary glands in the mouth, which release amylase. This initial step for digestion is highly important. In the stomach, natural salt stimulates hydrochloric acid and a protein-digesting enzyme, both which help to break down food. It also stimulates secretions in the intestinal tract and liver to help with digestion. Adding a pinch of sea salt has a triple benefit effect: The increased water intake hydrates you first thing in the morning, the sea salt helps absorb the water and, in turn, aids in helping your digestive tract. The act of skipping breakfast can be one of the most freeing habits you’ve added to your lifestyle. Just think about the amount of time you take to figure out what to eat in the morning while trying to run out the door for work. You don’t need to eat breakfast. In fact, not eating first thing in the morning has a plethora of amazing benefits that come along with it. Once you apply it to your life it frees up your time, increases your brain power and really allows your body to operate at peak efficiency. We’ve blasted the myth of the importance of eating breakfast. What about those other myths about burning fat and losing weight? Is following them halting your fat-loss progress? If you’re ready to turn your body into a fat-burning machine, you’ll want to check out the brand-new book The All-Day Fat-Burning Diet. Click here for more details.